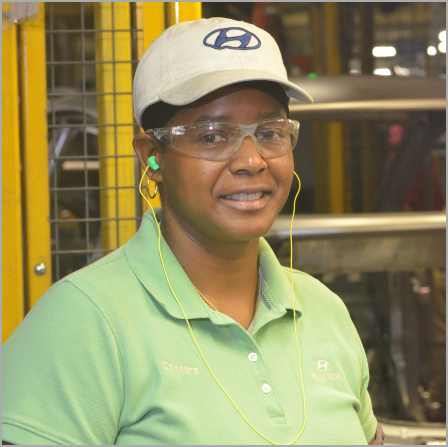 HMMA Team Member: Calandra Mills | Hyundai Motor Manufacturing Alabama,LLC. Calandra Mills is a Team Member in the weld shop, working on the BC1 line. She joined the HMMA family back in February 2006 and is quickly approaching her 10-year anniversary with the company. Calandra’s enthusiasm paid off, and once she got her job offer and completed her training, she learned exactly what that “anything” would be. Now, nearly 10 years later, Calandra is very happy with her role in the weld shop and says any time things get demanding she thinks back to her initial enthusiasm and keeps that do-anything attitude.